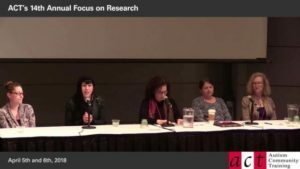 Addressing Mental Health in Autism : Should We Treat the Person with ASD, the Family, or the Community? 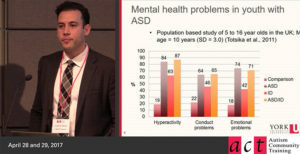 In this fascinating keynote presentation, Dr. Jonathan Weiss, one of Canada’s leading autism researchers, describes the individual and contextual factors that increase the likelihood of mental health problems for individuals with autism. 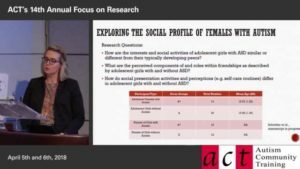 Drawing on the research, and his extensive clinical experience, Dr. Weiss offers important insights into the ways these problems can be alleviated by working with individuals, families, and communities. Recognize ways that mental health problems present in people with autism. Identify individuals at risk and contextual risk factors for mental health problems. Describe interventions to address mental health problems. Jonathan Weiss holds the Canadian Institute of Health Research Chair in Autism Spectrum Disorders Treatment and Care Research. 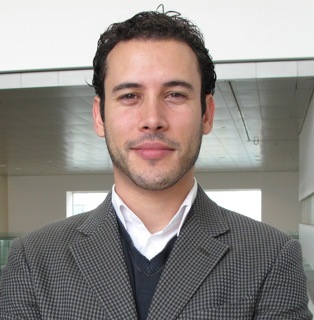 He is a Clinical Psychologist and Associate Professor in the Department of Psychology at York University in Toronto. Dr. Weiss’ research focuses on the prevention and treatment of mental health problems in people with ASD and/or intellectual disabilities across the lifespan. He is interested in their health service needs, their emergency service use, and their experiences of psychiatric crisis. Families play a critical role in the health of people with developmental disabilities by providing them with care and enabling their access to health services, one of Dr. Weiss’ research interests is the experience of family caregivers. In addition, he is interested in program development and evaluation. 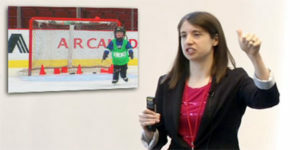 Dr. Weiss has a specific interest in the impact of Special Olympics on the psychological well-being of participants, and of cognitive-behavioural and social skill interventions to promote resilience and improve the mental health of children and adults with developmental disabilities. What should be measured to document the impact of an intervention so as to demonstrate that it can have positive health implications?